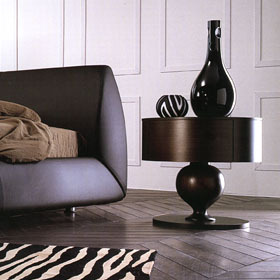 Bedrooms represent today an important part of the furniture of a home. As rooms are growingly getting smaller and smaller, manufacturing companies offer a number of solutions to adjust your bedroom to the available spaces. Wardrobes, for example, with shutters or with sliding or folding doors in different sizes. It’s necessary to emphasize the numerous ways in which colours may be combined, from cheery tree to modern black durmast as well as nuances of lacquered materials and glass with the possibility of choosing the handles and the internal accessories. Beds may be in wood with modern lines, padded (with removable covers), with drawers to make full use of the room under the bed; we also have iron beds in different colours or satin with leather fittings. Beds and wardrobes may be combined with night tables or benches or wood panelling to create something new and particular… Arredamenti Torresi only relies on high quality firms which focus their attention on the different units to offer quality and reliability.